One may think that with all the advances in technology today, like the highly detailed images of an ultrasound or an MRI scanner, the stethoscope would fall behind. But, it seems the stethoscope is still a versatile and cost-effective tool. It allows doctors to detect early signs of illness for a relatively manageable budget. The stethoscope is 200 years old. In 1816, a French physician named Rene Laënnec did not feel comfortable pressing his ear to a female patient’s chest to listen what was going on. So he rolled a sheet of paper into a long tube. He placed one end on the woman’s chest and the other end on his ear. He was “surprised and elated to be able to hear the beating of her heart with far greater clearness than with direct application of his ear.”1 Laënnec discovered that heart sounds could be clearly appreciated using this device, so he spent 3 years testing and correcting his design. He settled for a hollow tube of wood with a 3.5cm diameter and 25cm length. Laënnec’s portable instrument was fitted with a plug, and he used it to listen to the heart and lungs. His invention was the precursor of the modern stethoscope. Laënnec is considered to be the father of clinical auscultation. He wrote the first descriptions of many pulmonary diseases, such as pneumonia, he perfected the art of physical examination through the chest, and introduced many clinical terms that are still used today, like murmurs and melanoma. The truth is that medical schools still teach the art of listening. Stethoscopes have many uses. The heart is not the only sound that matters. Doctors use it to listen to the lungs and tell whether there is fluid residing in the airway passages. The stethoscope is also used to listen to the bowel to help diagnose digestive disorders. Pediatricians and obstetricians also use it to hear fetuses’ heartbeats in the womb. Current advances in technology have their limitations. For example, a CT scan can be used to provide an image of an enlarged heart, but it does not provide a conclusive diagnosis. X-rays cannot be used on pregnant women, the stethoscope can. Electrocardiography and Spirometry are other procedures that follow a good “hearing” of the heart and lungs through a stethoscope.4 A stethoscope is still the first tool a doctor uses to perform an initial study of a patient. It has become a bonding tool for doctor and patient. When people visit their doctors, they expect to be examined with some human touch rather than a machine. The stethoscope is a multi-function instrument, and it is used to listen to different things on a single patient. Unlike cassette tapes which were replaced by mp3s and CDs, the stethoscope is here to stay, like the vinyl record has. True audiophiles still claim that vinyl analog sound cannot be replaced by digital sound. Maybe the stethoscope is destined to co-exist next to more advanced technologies still to come, like an ultrasound that connects to a smartphone. To this day, radio telescopes work alongside deep space probes. It seems there is something quite special in the human ear that can’t be easily replaced by new technological breakthroughs, at least not anytime soon. 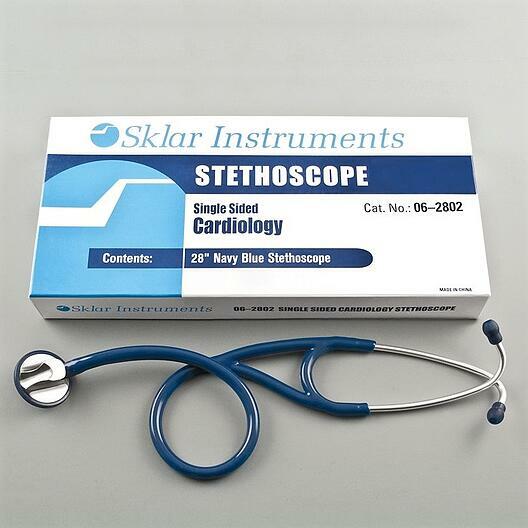 If you would like to browse through Sklar's fine line of stethoscopes, please click on the image below. 1Roguin, Ariel MD. (2006, September). Rene Theophile Hyacinthe Laënnec (1781-1826): The Man Behind the Stethoscope. 2Rogers, Kaleigh. (2016, February 5).Why Are Stethoscopes Still a Thing? 3English, Taunya. (2016, February 9). In its 200th year, some say the stethoscope is obsolete. 4Are Stethoscopes Soon Going to Be Obsolete?